Many had expected that the Nigeria Women Premier League Super Four championship would culminate in an epic battle between arch rivals Rivers Angels and Bayelsa Queens but it has been so far so bad for both teams at the Samuel Ogbemudia Stadium in Benin City Edo State. With two defeats from two matches already, no form of mathematics can help a ‘pointless’ Rivers Angels reach the final of the 2016/17 NWPL Super Four and this ultimately halts their dream of a fourth successive league title. Following their opening day 2-0 loss to Delta Queens, the Jewel of Rivers desperately craved a victory on Tuesday against Nasarawa Amazons but found themselves trailing after five minutes. Adejoke Ejalonibu’s opener caught the defending champions off guard and before they could fully recover, Mabel Effiom, while trying to clear Anam Imo’s low cross, recorded the first own goal of the championship to extend Nasarawa Amazons’ lead. Rivers Angels probed the most in the second half but their only goal scored by substitute Mercy Amanze counted for little in the end. After Nasarawa Amazons sealed their place in the final of the NWPL Super Four, all eyes were on Delta Queens to follow. 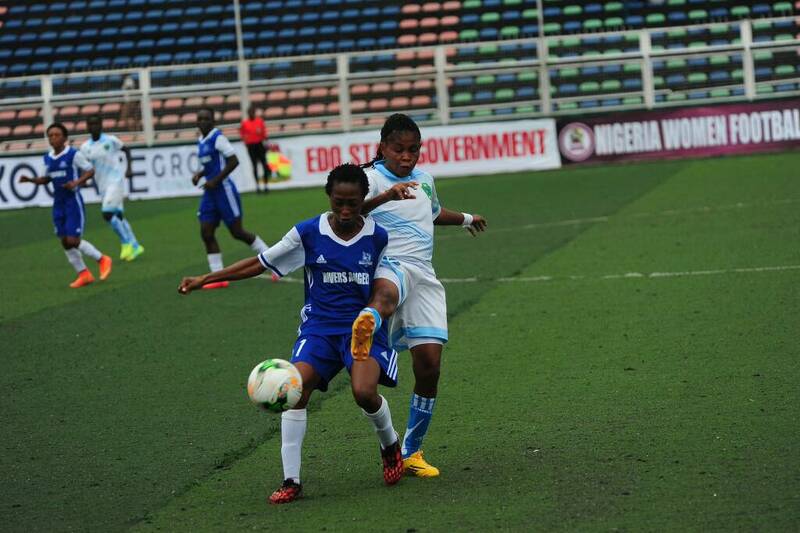 But their opponents Bayelsa Queens proved a really hard nut to crack. Bayelsa Queens had pledged to claim their first win of the championship at the expense of their neighbours and they revealed their intention from the get-go, leading to Tessy Biawho’s third minute disallowed goal. But it was Delta Queens who actually took the lead when Margaret Etim’s long pass found Amerat Adebisi Saheed who in turn sent a low shot past Jonathan Alaba in goal for Bayelsa Queens. Not long after that, Tessy Biawho responded for Bayelsa Queens and the 1-1 result means the Restoration Girls still have a slim chance of qualifying for the Super Four final on Thursday. Wednesday is rest day but there would be a mini tournament for school girls tagged “Football for Social Good”. Edwin Okon (Head coach of Rivers Angels): No goal at all is managed. It is not easy for an attacker to convert a goal so it is not managed. We’ve lost, we’ve lost. It’s a hard one. You’ve seen the game, use your tongue to count your teeth. I do not think of fatigue, I think of the ‘officiating priest’. I had thirty players – you can see the changes – so it’s not fatigue. Our plan was to take the (league) cup back (to Port Harcourt).